Zion Market Research has published a new report titled “VCSEL Market by Application (Data Communication, Industrial Heating, Infrared Illumination, Pumping and Sensing) for Data Centers, Consumer Electronics, Automotive, Industrial, Healthcare and Others End Users: Global Industry Perspective, Comprehensive Analysis and Forecast, 2015 - 2021”. According to the report, the global VCSEL market accounted for around USD 760.00 million in 2015 and is expected to reach USD 2,414.91million by 2021, growing at a CAGR of around 21.3% between 2016 and 2021. Vertical-Cavity Surface-Emitting Lasers (VCSELs) are a relatively latest type of semiconductor lasers. VCSEL has gained a reputation as a superior technology for short reach applications such as infrared illumination, fiber channel and intra-systems links and automotive. VCSELs became the technology of choice for short range datacom, local area networks, and effectiveness as displacing edge-emitter lasers. The use of VCSEL was mainly due to the VCSEL’s lower manufacturing costs and higher reliability compared to edge-emitters. 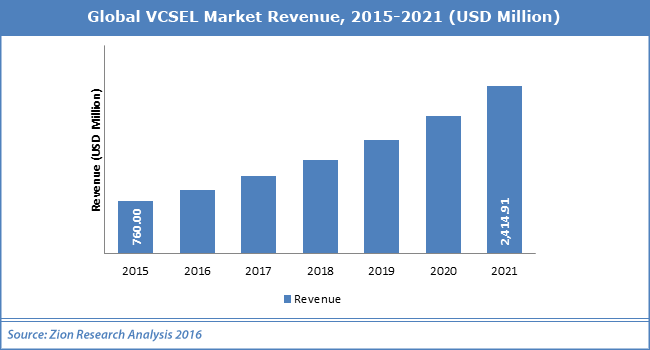 Advancement in automotive electronics, growing number of data centers and increasing demand from high-end applications such as gesture recognition and 3D imaging are some of the major driving factors expected to propel the growth of VCSEL market in coming years. Ongoing technological advancement enables to use VCSEL in huge amount in infrared illumination. Increasing demand of cloud computing solution is expected to surge the growth of VCSEL market in near future. However, restriction to short-distance communication due to the limited range of VCSEL is expected to have the adverse impact on VCSEL market. Nonetheless, technology like laser-assisted hard disk drive is expected to open up new growth opportunities for VCSEL market in coming years. Data communication was leading application segment with over 57% of share in 2015, and expected to maintain its dominance throughout the forecast period owing to the construction of new data centers for data analytics coupled with cloud computing solutions. Sensing application segment is expected to exhibit high growth in China market. The technological advancement of VCSEL & greater use in infrared illumination is expected to fuel demand for infrared illumination in coming years. Based on application, data center and automotive end user segment are expected to be most attractive end-user segment in the forecast period. Automotive end user segment is expected to grow at the highest CAGR of 25.11% during the forecast period. Rising demand of VCSEL in consumer electronics is expected to boost the growth of consumer electronics application segment. North America was the largest market for VCSEL in 2015 and expected to continue its dominance throughout the forecast period. Europe is expected to show remarkable growth. This growth is mainly driven by rising use of VCSEL in consumer electronics. Asia Pacific is considered to be the fastest growing regional market for VCSEL, and growth of this region is mainly attributed to growing number of data center paired with significant growth of the automotive sector in China and India.